Paul is the co-creator of nightzookeeper.com, which is an educational game designed to help children develop their writing skills. During March 2016, the platform saw over 7 million words published on it, as children contested World Creative Writing Month. 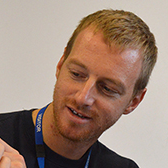 Paul previously worked as a teacher since graduating from Newcastle University over 10 years ago. He has worked in a range of schools from London to Abu Dhabi. He is always striving to improve his professional practice as an educator and is dedicated to the cause of getting more children engaged with creative writing through games.